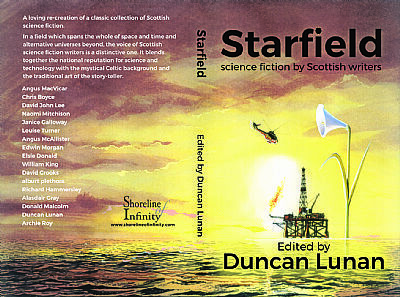 Edited by Duncan Lunan, paperback, 210mm x 140mm, 246pp. .
A loving re-creation of a classic collection of Scottish science fiction. Originally published in limited edition in 1989, Shoreline of Infinity is privileged to be able to re-release it for a new generation of science fiction readers in Scotland and worldwide. Cover by Sydney Jordan, creator of Jeff Hawke and Lance McLane. Published by Shoreline of Infinity at £11.95 on 1st June, 2018. Pre-order price £10.95, at https://www.shorelineofinfinity.com/product/starfield.